In the near future, a virus gets loose in Manhattan. Most of the world dies; a few survivors turn into light-shunning blood hunters who look very much like steroidal versions of The Weekly World News' mascot Bat Boy. In his townhouse fortress, a military officer, Robert Neville (Will Smith), keeps watch and works on a cure. As an actor, Smith has always given the impression that being the last man on Earth would be OK by him. 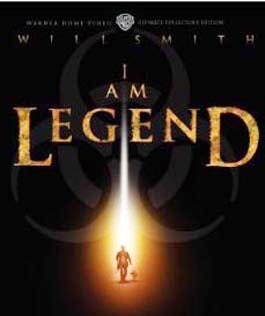 In I Am Legend, it takes a really sensitive and liquid-eyed German shepherd to wake him up, but ... let's put it this way: those too sensitive for Marley and Me are going to want to avoid I Am Legend as well. The most affecting moments are the scenes of a deserted Manhattan in 2012. The city is reverting to forest, with deer bounding over the cracked windshields of abandoned cars. Eventually, however, it's all another video game, which heads into calculated, scornfully directed religious whackadooism, including sacred blood, a call to faith and a Monty Python–style holy hand grenade. Just in time for Christmas, Warners has issued a boxed collectors edition that contains everything but polyester dog fur: a book full storyboard images; the Internet-popular alternative ending; a digital copy for downloading; background docs; some rather static cartoons; trading cards; and something called a "lenticular," which is a high-tech paperweight with moving images, not unlike those old devotional flicker cards that showed two different images of the Virgin Mary depending on the angle you viewed them at.